The 31st Soreen Stanbury Splash. Sunday 19th Jan 2014. FRA Category BM race. Starts 11.30 a.m. From Penistone Hill Country Park, nr Haworth, Keighley, W.Yorks. (GR 025364). (Registration in the cricket club near the quarry.) £4 entry on the day only. Teams (3) free. PM. Over 18. Records: 41:53 Ian Holmes 2006; f. 49:01 Natalie White 2006. The Soreen Stanbury Splash race is celebrating its 31st birthday on 19th January 2014 and it prides itself with being associated with Soreen. The 7 mile race is affectionately known as the Soreen Malt Loaf Run to runners young and old who just love the fruity taste of a Malt Loaf. Over the years the junior and senior races have introduced thousands of runners to the joys of fell running and seen superstars like Triathlon Olympians Alistair and Jonathan Brownlee; National and GB Internationals Ian Holmes, Robert Jebb, Tom Adams, Colin Donnelly, Jack Maitland, Mary Wilkinson, and Jo Buckley; and former World Champions Victoria Wilkinson and Carol Greenwood, make their mark in sport. Course as in 2012 - Google Map. 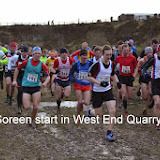 SOREEN JUNIOR QUARRY RUNS (R). CS. 10.30 a.m. from Penistone Hill Country Park, near Haworth, Keighley, W.Yorks. (GR 025364). £1. PM. U8 (over 6), 0.8k/30m; U10/U12/U14, 1.6km/50m; U16, 3.2km/100m. Records: see `Quarry Runs' page. All finishers receive a "Soreen Junior Goody Bag"! Prizes for best fancy dress. Free coffee and biscuits for parents.